Sweet and tart, candied cranberries are an unexpected quick dessert idea. These are so addicting, you'll be eating this treat by the handful. 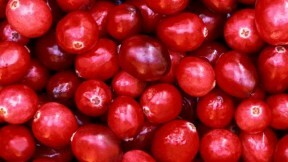 Wash cranberries and spread an even layer on the bottom of a shallow baking dish. Sprinkle with sugar, cover tightly, and bake in a preheated 350-degree oven for 1 hour. Give them an occasional stir during baking period.